A 38 North exclusive with analysis by Joseph S. Bermudez Jr. and Jack Liu. 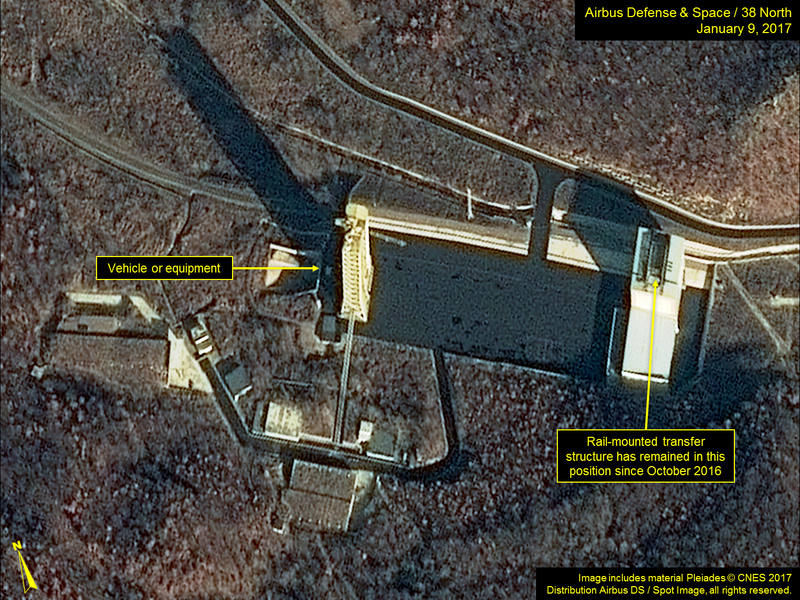 While North Korea threatens to test an intercontinental ballistic missile (ICBM) and speculation continues that Pyongyang will conduct a provocation (such as a satellite launch or rocket engine test) to “test” the incoming Trump administration, commercial satellite imagery from November 2016 through January 2017 of the Sohae Satellite Launching Station provides no evidence of an imminent launch or engine test. However, the site does remain capable of conducting a launch or engine test at any time and with little warning. 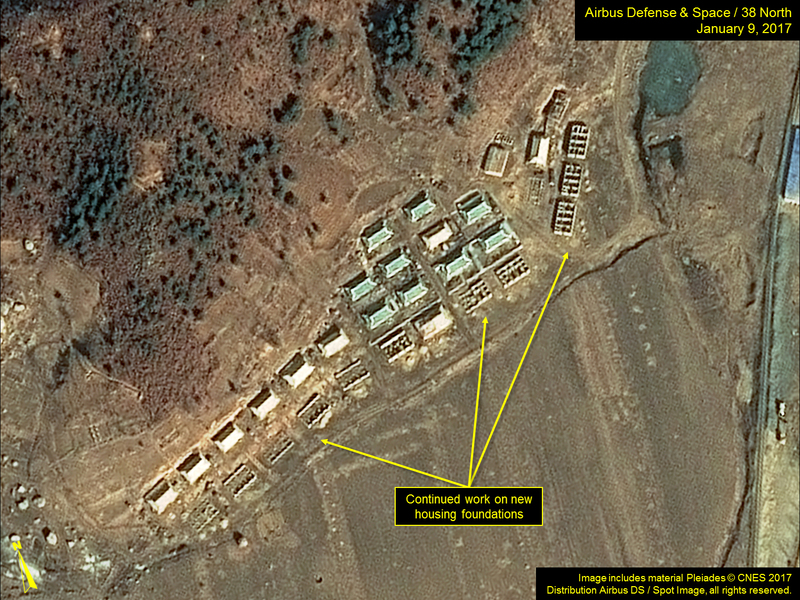 Activity at the Sohae launch facility over the past three months indicates both long-term preparations for an engine test and further infrastructure development including paving of roads, construction at support and warehouse facilities and continued housing development. At the vertical engine test stand, the rail-mounted environmental shelter that had been positioned up against the test stand since last summer was moved sometime between December 14 and 29 back onto the main apron. This is where an engine is usually prepared before being placed within the test stand. However, as of January 9, the shelter has not moved back to the test stand. The environmental shelter prevents us from knowing whether a rocket engine is inside, but the lack of other indicators, such as activity near the telemetry and observation facilities, suggests that no engine test is imminent. Moreover, both natural-color and color-infrared imagery indicate that there have been no unreported tests during the last three weeks. The access road to the test stand was sealed (paved) during late October through early November with what appears to be a light coat of “chip” (gravel or glass). This appears to be part of a “beautification” plan similar to what was done ahead of the 2012 Unha launch, when foreign reporters were invited to the site. 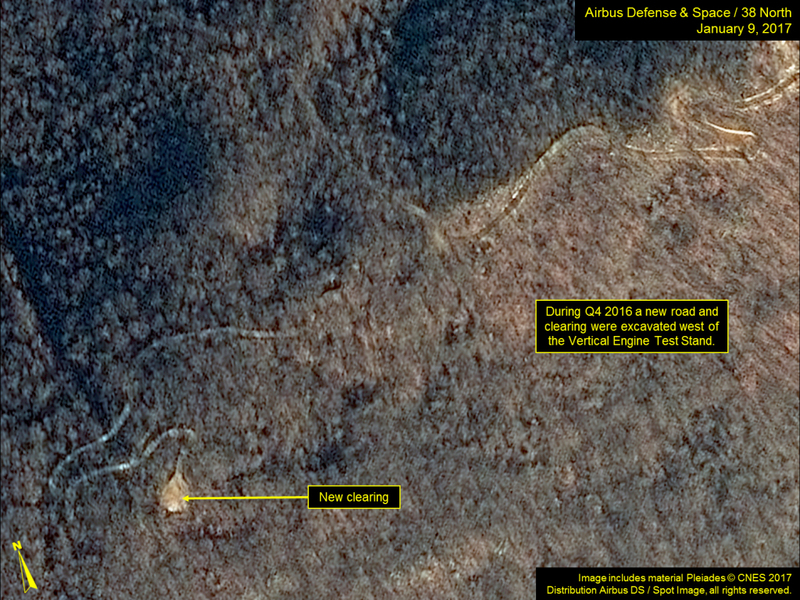 Additionally, immediately northwest of the engine test stand, a new road has been built extending off the road to the VIP Observation Building. This road leads to a cleared area that will likely be developed into a telemetry or guard position. Figure 1. The rail-mounted environmental shelter was moved back to the main apron in late December and remains there. Figure 1A. The rail-mounted environmental shelter was moved back to the main apron in late December and remains there. Figure 1B. The rail-mounted environmental shelter was moved back to the main apron in late December and remains there. Figure 1C. The rail-mounted environmental shelter was moved back to the main apron in late December and remains there. Figure 2. Roads throughout the facility have been “sealed” (paved). Figure 3. A new road has been built, leading to new cleared area. At the launch pad, the main access road, the launch pad and the road supporting the fuel and oxidizer buildings were also sealed during the second or third week of November. Paving the base of the gantry tower is unusual as the exhaust from any future launch will likely melt the sealant over the immediate area. However, it does make the rails supporting the transfer structure clearly visible. What may be a small vehicle or piece of equipment is visible on the north side of the gantry tower in the January 9 image. No activity has been observed near the fuel and oxidizer building during the past three months. 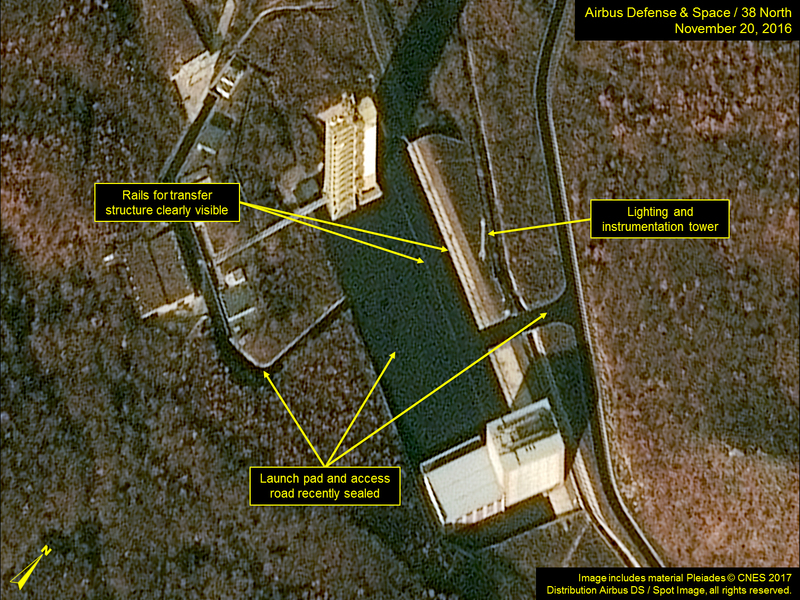 Although the environmental covers around the gantry tower preclude a definitive assessment, it does not appear that launch preparations are underway. 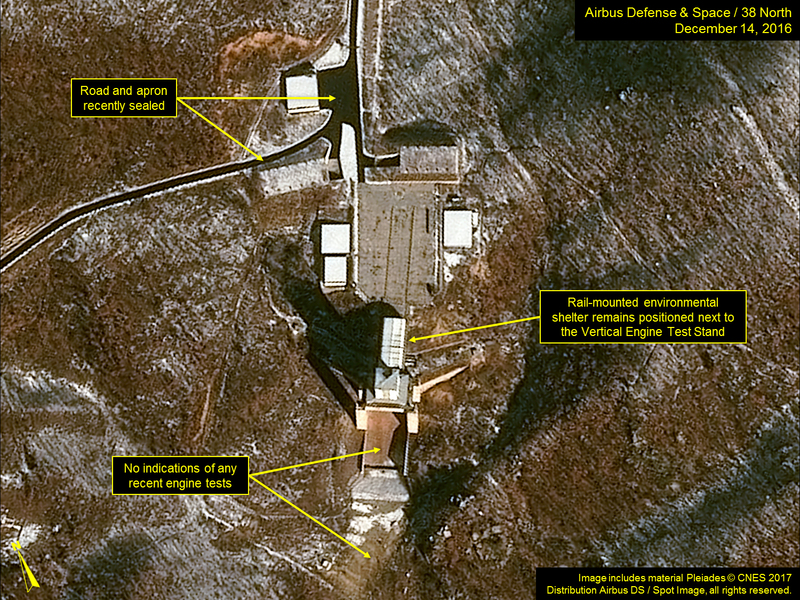 Still, all indications are that the pad remains capable of supporting a launch at any time. Figure 4. 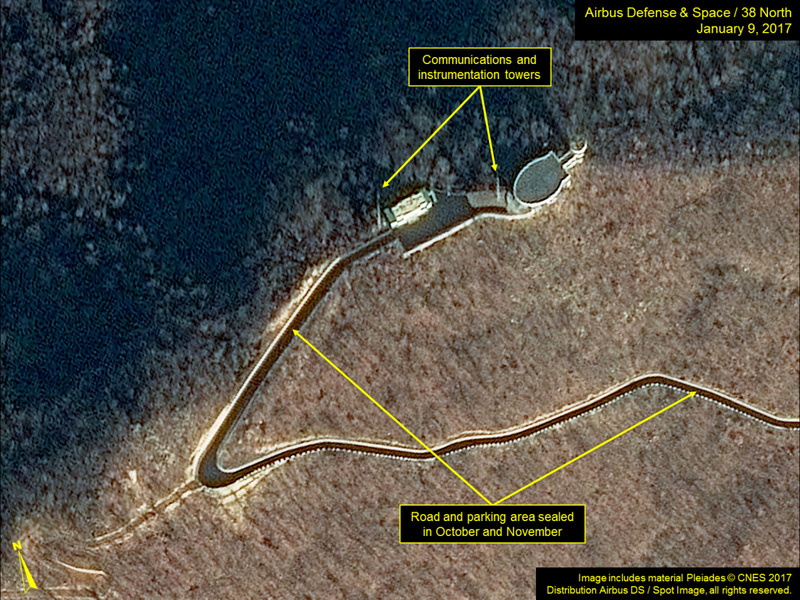 Roads leading to and from the launch pad have been sealed along with the pad itself. Figure 4A. Roads leading to and from the launch pad have been sealed along with the pad itself. Figure 4B. 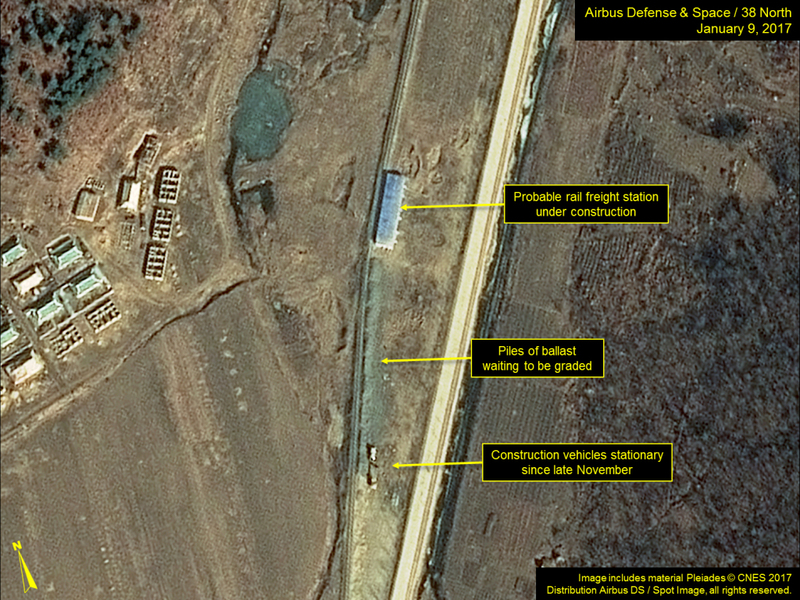 Roads leading to and from the launch pad have been sealed along with the pad itself. 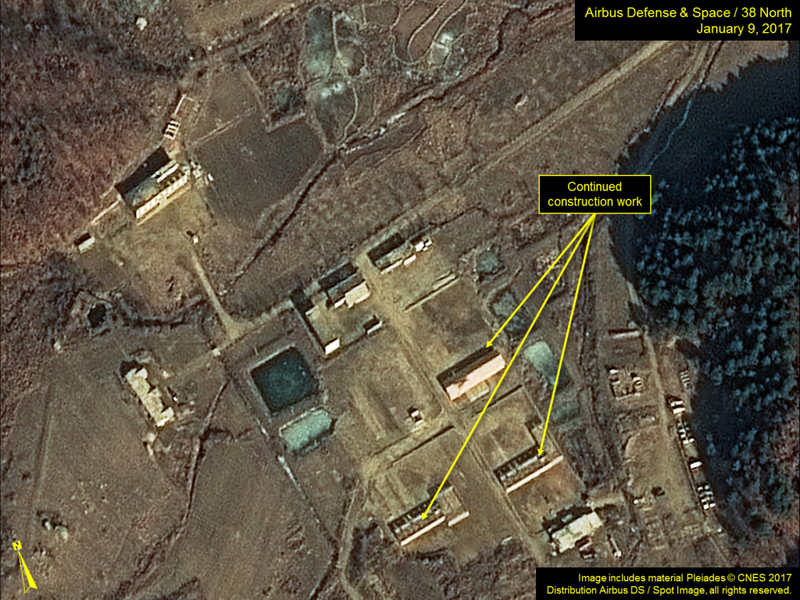 Since last summer, the warehouse and support area on the north side of the Sohae facility has been partially razed and several new shops, warehouses and support buildings are under construction. Construction continues, but has slowed during the winter. Figure 5. Construction continues at a slow pace at the support and warehouse area. Approximately 500 meters north of the main facility entrance, the rail maintenance work and construction of a probable small rail station appears to have been suspended since mid-December. The work does not appear to be complete as ungraded piles of ballast remain alongside the tracks. Minor construction activity (i.e., construction of foundations and walls) at the housing area opposite the new rail station continues at a very slow pace, likely due to winter. Figure 6. Work on a probable rail station north of the secure area has been suspended. Figure 7. Construction continues at a slow pace at the housing area. 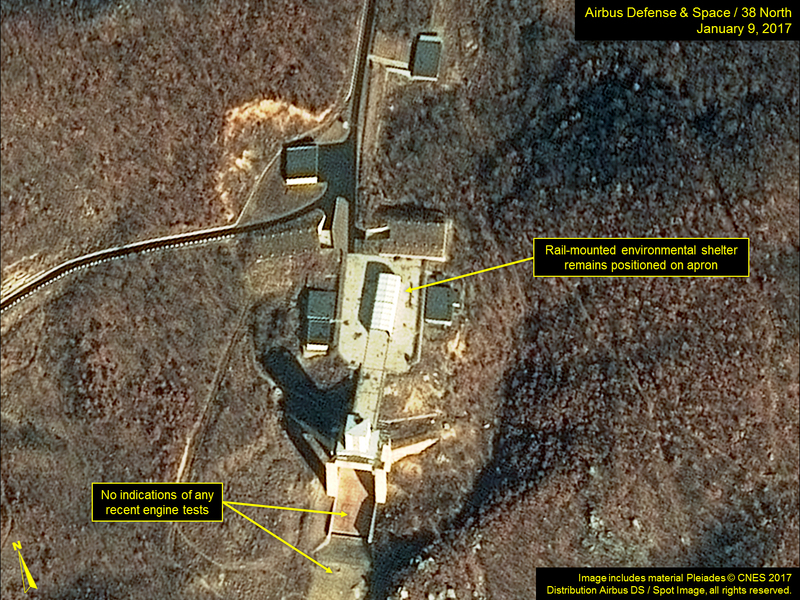 The recent North Korean threat to test an intercontinental ballistic missile (ICBM) “…anytime and anywhere determined by the supreme headquarters of the DPRK” would not likely directly impact the Sohae Satellite Launching Station since these will likely be conducted from a transporter-erector-launcher that can be located anywhere within the nation. 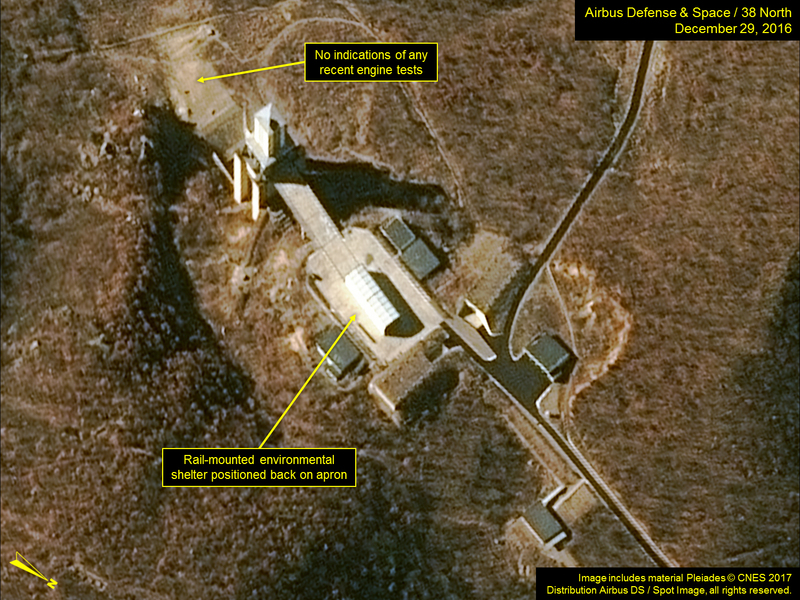 “North Korea says can test-launch ICBM at any time,” Reuters, January 9, 2017, http://www.reuters.com/article/us-northkorea-missiles-idUSKBN14S0JE.